Electronic guitar tuners come in all shapes and sizes (and prices! ), but they all aim to do the same thing - tune your guitar accurately and quickly. Of course, you don't need electronics to do the work for you. 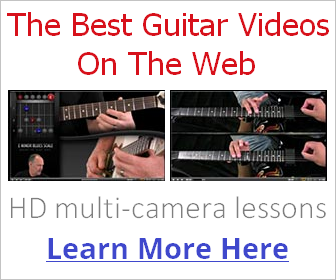 You can tune just as accurately using the methods on the main guitar tuning page, once your ear is "trained" to do it. Anyway, I thought I should cover the different types of electronic tuners out there for those of us who need visual tuning reference (e.g. when you're gigging or in a noisy rehearsal studio). On a tight budget? See the top 3 cheap guitar tuners as rated by users. If playing an electric guitar, you need to send the signal from your guitar to the tuner so it can pick up the pitch of each string and tell you if its tuned or how out-of-tune it is. When it's all plugged into the chain, you can refer to it any time you need, and because you've fed your guitar's cable through it, it blocks out any additional noise (e.g. from your annoying bassist/drummer who won't shut up for 5 seconds between songs). If you're playing an acoustic, most decent tuners come equipped with a small, inbuilt microphone, but obviously it will pick up any additional noise that's going on around you, so you need to find a quiet spot to tune up using the microphone. 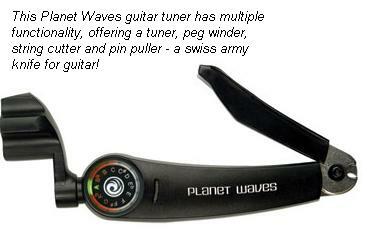 You can also buy clip-on tuners that detect the note vibrations from the guitar through the headstock. More on this type later. 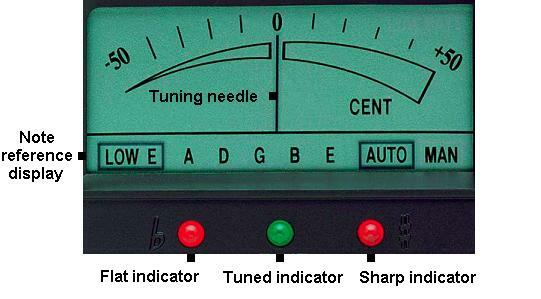 Some tuners will include more than one flat and sharp indicator to represent a wider flat and sharp range. When using the tuner above, if you strike one of the guitar's strings, a box will appear around the note you're closest to. If you're tuned too low, the flat indicator (symbol: b) will light up and the needle will lean towards the left. As you tune up, the needle will respond by moving closer and closer to the center until the green "tuned" indicator lights up. If you're tuned too high, the needle will lean to the right and the sharp indicator (symbol: #) will light up. As you tune down, the needle will follow until you're in tune and the green indicator lights up. You need to know the note you're trying to tune to. For example, if you want to be in standard tuning (E A D G B e), you'll know the 4th string should be D.
Most tuners will also let you pre-select a note to tune to. This is useful when there is interference and for some reason it won't automatically recognise or pin down the note (I've found this does happen on cheaper tuners). It's also useful when you're quite far off the desired note (e.g. when you've just put a new string on and you want an immediate reference to how far you are off the tuned note). If the tuner is chromatic, it will be able to identify and tune around any of the 12 notes, otherwise it will be pre-programmed to identify the notes within a set guitar tuning (e.g. standard E-A-D-G-B-e notes). When you strike the note, a note letter will be highlighted on the LCD screen of the tuner to tell you where you're at (this display varies). Pitch pipes - quite a few guitar tuners include pitch pipes in their feature set, which allows you to hear the note you want to tune to in a long, continuous tone. If a string is slightly out of tune, you'll hear this conflicting "vibration" effect between the sound of the pitch pipe and the guitar string, which becomes flattened once your string is in tune. Most tuners with the pitch pipe feature play 12 chromatic tones for tuning reference. 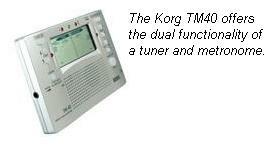 Metronome - another common additional feature on tuners is a metronome. A metronome helps you keep in time to a rhythm when you're playing by yourself. Actually, you don't need to buy one if you play guitar by your computer a lot... here's a free online metronome you can use. Tuning peg winder - a tuner built in to a peg winder? Wacky idea... it might just catch on! When you put new strings on your guitar, a peg winder allows you to get it wrapped in place much quicker than by hand. Some peg winders are like swiss army knives for guitar, utilising a string cutter, string stretcher and bridge pin puller (for acoustic guitars). 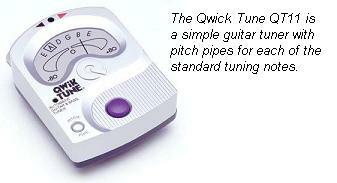 Tone bank - simply allows you to save your own tuning, string by string, to the tuner's memory. Useful for quick referencing alternate tunings in the future. 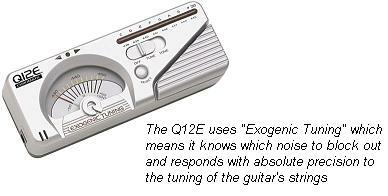 What is an Exogenic guitar tuner? Exogenic tuning continually "samples" the note you play to discern and ignore room noise and other unwanted signals. This means you can tune with less time and hassle even in a fairly noisy environment. Of course, each tuner is different, and will come with a manual to help you figure out the controls and how things will be displayed to you on the screen. So, what's the difference between an analogue and digital guitar tuner? Not much - analogue tuners can still use digital functionality except for the reference needle, which instead of being part of the LCD display, is actually a needle that responds to pitch. Some guitarists think analogue tuners are more accurate because with LCD, the needle has a set number of positions to light up on the screen, whereas with analogue, the needle is not set to certain positions meaning you can see if you're even the tiniest bit out of tune. Remember - digital is about "switches" being on or off (the whole "0 and 1" thing). Analogue is constant and has an infinite number of positions between on and off (or "1 and 0"). Clip on guitar tuners - clip on tuners can be attached to your guitar (usually at the head stock) and they will pick up the vibrations as you strike the string you want to tune. Because it picks up vibrations, it's totally isolated from other noise around you, which means you can tune referring to the visual LED and display without any interference. Plus, they're not too expensive! Foot pedal guitar tuners - pretty self explanatory! Just like a regular effects pedal, the tuner has a stomp button and a larger LCD screen so you can do some shoe gazin' and tune up on set. I hope this page has given you a useful guide to some of the guitar tuners available out there. 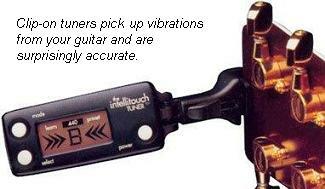 Don't forget to check the best guitar tuners guide for more in depth reviews and demos.